For a book about garden people, rather than gardens, to succeed and hold interest, they need to be exceptional people with stories that are relevant to and resonate with everyday gardeners. Dr Anne Vale’s list is impressive, covering garden communicators and educators in print, radio and television, as well as a range of garden designers from around Australia. 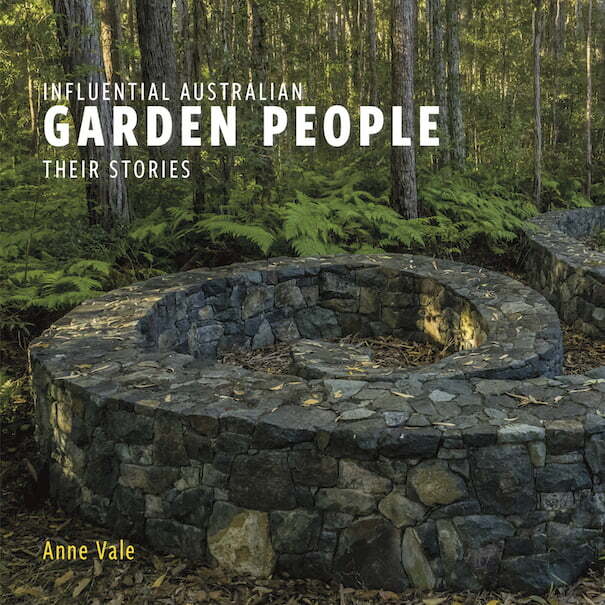 ‘Influential Australian Garden People‘ builds on the historical perspectives of Anne Vale’s first book, ‘Exceptional Australian Garden Makers‘ which examined landscape design in Australia up to the 1980s. The first section of this new book concentrates on the communicators, or the ‘mind shapers’ as Anne calls them. Some have a high national profile like TV presenters Jane Edmanson and Josh Burne and others are better-known in their own states like South Australia’s Merilyn Kuchel and Queensland’s Paul Plant. Regardless of personal reach or fame, each has a good story to tell about why and how they became interested in gardening and then how it became a career. I like the way Anne Vale brings these stories to life as we hear a background description of each person from her, and then lots in that person’s own words, with long quotes forming a decent proportion of the text. This is refreshing as it feels more like an interesting and often quite peppery conversation than a third-person retelling. And Anne Vale’s prose is eloquent but also easy to read. 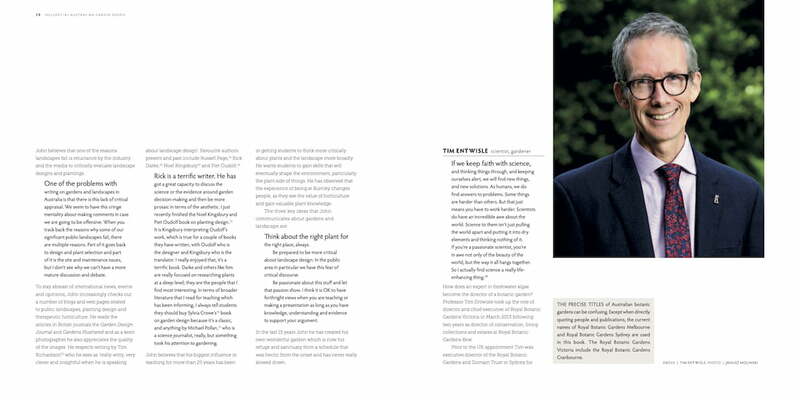 I was also delighted to discover the many strong opinions among those interviewed about where gardening is today in our national psyche and what has maybe gone wrong with how we think about it, do it and teach it. Too much of what we read and hear about gardening is lovely light-hearted fluff, as if the world is a wonderful place full of excited and interested gardeners. I wish it were true but we all know that it isn’t. There’s this strange dichotomy between many in the commercial side of the industry saying how garden-related businesses – nurseries in particular – are going under, and those in radio, TV and print land telling us how wonderful everything is, as if we’d all despair and stop if we knew the truth. 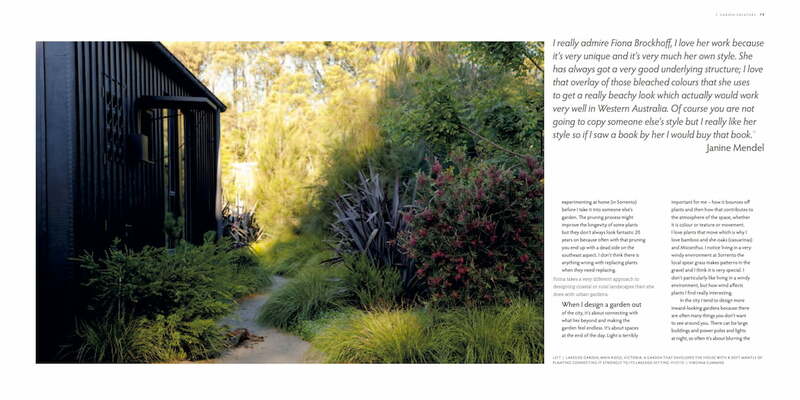 The book then moves on to in-depth interviews with 11 Australian ‘garden creators’, successful professional landscape designers who talk about their influences and approaches to design. As is often the case, whether it’s in books, garden shows or TV (although, interestingly, not radio), I’m a bit disappointed that men outnumber women 8 to 3. As a Sydneysider, I also notice that designers from Melbourne and southern and western Australia are favoured, with only one designer based in Sydney and one from Queensland. However I was still intrigued to learn from where these designers draw inspiration. 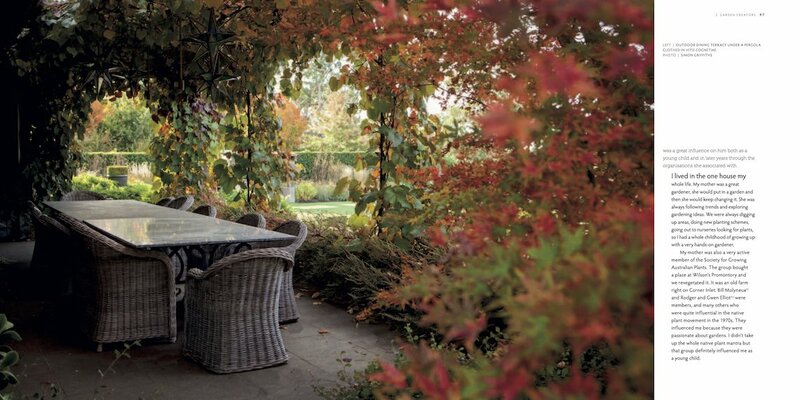 Many of the same famous garden design names pop up from different designers, with Australians Edna Walling and Ellis Stones the most frequently mentioned. Interestingly, those who have come through a Melbourne (Burnley College) design education also often mention John Patrick, landscape architect and Gardening Australia presenter as being a strong influence on their approach to landscape design and as seeing it as a professional career. What a wonderful accolade for a wonderful teacher! 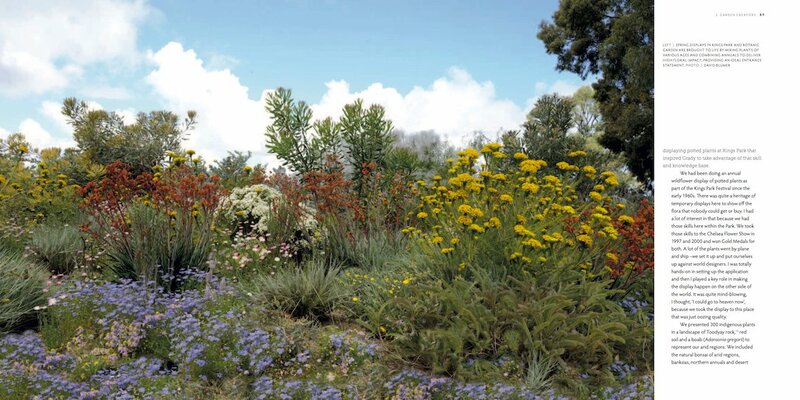 It is easy to see why Burnley has fostered so many of Australia’s top garden designers when its past students had lecturers like John and academics of the calibre of Drs Greg Moore, Ruth Bellin and Peter May to instruct and inspire its students. Pleasingly, many of the designers also talk about the inspiration they have found in each other. I think it’s a very good sign that there are designers in Australia with deep respect and admiration for each other’s work. 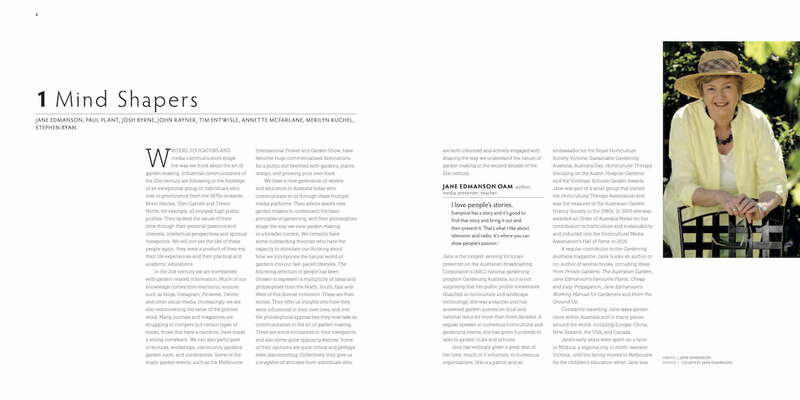 The last section of the book, ‘Unpacking the Themes‘, neatly sums up and then analyses what we’ve heard from both the mind shapers and the garden creators. Anne Vale first looks at why they have become who they are, identifying inspiration from parents and grandparents, teachers, and the natural bush. I had been struck, when reading the earlier chapters, by how many people interviewed for this book mention the influence of both parents and grandparents in their career choice of horticulture or landscape design. And this is not because they are being made to or even encouraged to garden, it’s because that’s what they saw their parents and grandparents doing for themselves. How will that happen in the 21st century, with busy helicopter parents thinking they must put all their own interests on hold in order to concentrate on those of their children? How will it happen when grandparents now downsize from the old family home and garden to apartments and villa units and retirement living? I’m not suggesting they shouldn’t, but those opportunities to teach by demonstration and observation are inevitably lost. And of course, the lack of freedom for children to roam as they once did, around the neighbourhood and down into to the local bush (if it even still exists) means that source of inspiration is similarly now gone forever too. Anne Vale continues on, to examine the interviewees’ perceptions that Australia lacks a critical analysis of gardens, lacks quality and in-depth writing and communicating about gardens and gardening, and lacks professional status for those in the horticultural industry, shown in the low rates of pay. I would have liked a longer chapter on this as I think it’s the most important part of the book, but I accept that these preferences might seem dull to others. I’m so relieved when I get a book to review and it’s been professionally designed and edited like this one. And the printing is top quality too, with clean and true colours and nicely weighted paper stock. As with any book about gardens, gardening and design, you’d expect that there would be sumptuous images and this book is one of the best I’ve seen in a while. There’s a range of photographers’ work here, as each designer tends to have his or her favourite but the images work together because they’ve been carefully selected to do just that. In fact, the photos are so good and the gardens so gorgeous, you could almost buy it for the pictures except that you’d miss out on so much. Most photographs show razor-sharp focus over a great depth of field and, when combined with the large format of the book (a double-page spread is 560mm wide), you get a great sense of immersion, as if you are looking into the gardens. Although this is a welcome change from the blurry images so popular among today’s photographers, there are a few images that follow the latest fashion for very dark photos which I don’t like. I know they look atmospheric and that the sun is the garden photographer’s enemy but do they need to be so dark I find myself peering at them to see the detail? These are Australian gardens and I prefer to see that the sun does shine on them as much as the rest of the country. David Blumer’s photos of Grady Brand’s planting designs in Kings Park in Perth are real standouts. These superb perennial and annual wildflower meadows made me realise that we have a quietly achieving Australian equivalent of Piet Oudolf in our midst. The large format means that pages without photos have lots of white space, but I like that too. One thing that would have made it easier when dipping in and out of the book was to have the name of each person in a page footer on each of his/her pages. The fonts are easy to read and used effectively to differentiate what Anne Vale has written and when she is quoting. And there’s only a limited and appropriate use of ‘break out’ boxes which contain extra information that would otherwise interrupt the narrative. Interestingly, showing her academic background, Anne Vale as also used numbered endnotes to add explanatory detail about people, places and events mentioned by her interviewees. This is wonderfully researched and valuable information and you could read this alone to pick up an excellent potted understanding of 18th – 20th century garden history. This book should be essential reading for anyone studying horticulture or landscape design/architecture today but it will also appeal to those interested in garden design and the social, political and historical reasons of why and how we make gardens. I’ll be checking out this book very soon. Thanks for another excellent review Catherine, what we’ve all come to expect from Garden Drum’s curator. Except that many people’s book shelves have hardly changed much in the recent past with the decline in publishing and in the face of Kindle etc, I would have passed over this one too .. I might have to break my ten year abstinance on book buying and get this one now !! Loving the sound of the large format and the way Anne has arranged this read, I hope there’s no permanent dent in my forehead from the lazy hammock this Xmas. But that would be a small price to pay for something that appears to be so well written ..
Like others mentioned in the book, I was humbled to find out I was on the list recommended by both local and interstate people. 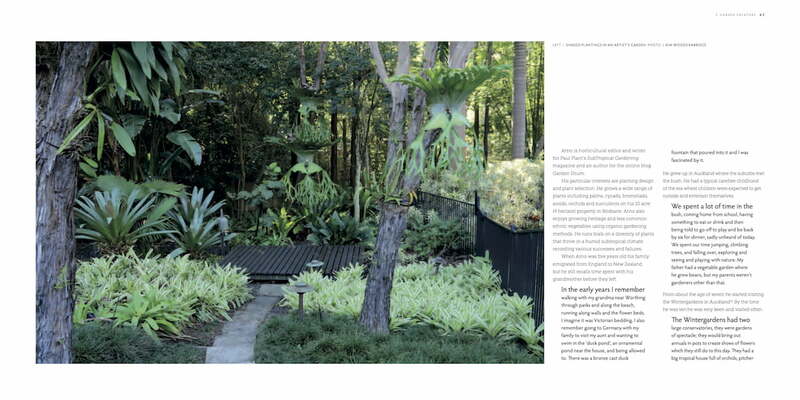 It was a wonderful opportunity to read about each person’s path into and along their horticultural journey.